Red dwarfs are by far the universe's most common stars, but it really doesn't seem like they're made for supporting life. The latest simulations suggest that the tidal forces of these stars' gravity would wipe out any chance of life. A few months back, we learned about how axial tilt - or the lack thereof - could cause climates to spiral out of control in planets around red dwarfs. Now we can add another big problem for any potential life-supporting planets around red dwarfs. Because these stars are so much smaller and give off so much less heat than our Sun, the habitable zone has to be much closer in. This means any potential Earths around a red dwarf experience much fiercer gravitational forces, despite their stars' diminutive size. Traditionally stellar radiation has been the only heat source considered capable of determining global climate on long timescales. Here we show that terrestrial exoplanets orbiting low-mass stars may be tidally heated at high enough levels to induce a runaway greenhouse for a long enough duration for all the hydrogen to escape. Without hydrogen, the planet no longer has water and cannot support life. We call these planets "Tidal Venuses," and the phenomenon a "tidal greenhouse." Tidal effects also circularize the orbit, which decreases tidal heating. 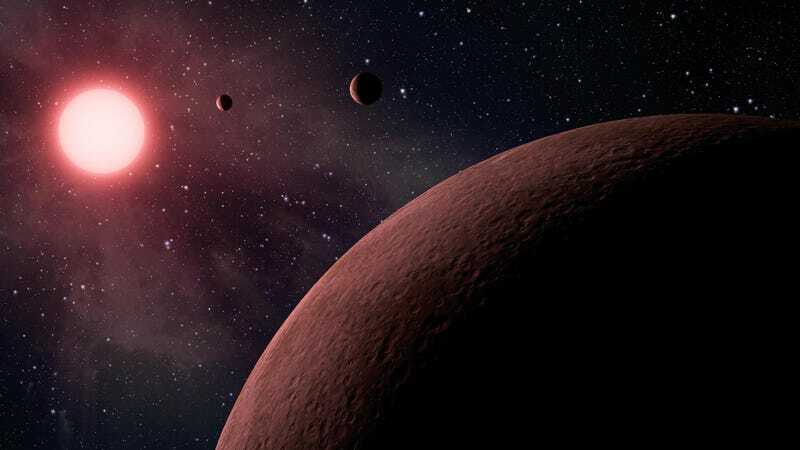 Hence, some planets may form with large eccentricity, with its accompanying large tidal heating, and lose their water, but eventually settle into nearly circular orbits in the habitable zone (HZ). However, these planets are not habitable as past tidal heating desiccated them. All this data suggests red dwarfs present something of a cosmic Catch-22. In order for a planet to be habitable at all, it must be close enough to its star to receive enough warmth to not just simply freeze. But that very same proximity means any water would be split apart into its constituent elements, with all the hydrogen vented into space never to return. As the researchers put it, these red dwarf planets "should not be ranked highly for detailed follow-up observations aimed at detecting biosignatures." That seems like a bit of an understatement. arXiv via New Scientist. Image by NASA/JPL.